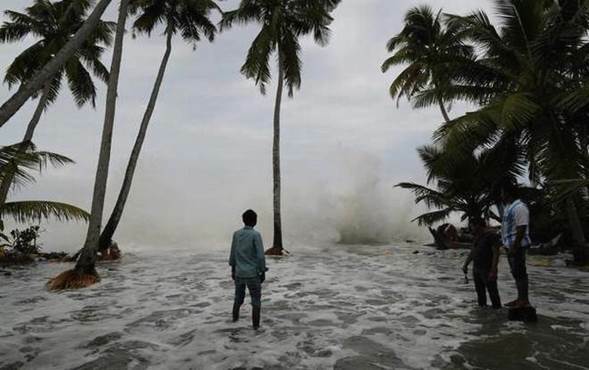 Hundreds of families in costal area s of Trivandrum was evacuated overnight to safe shelters after unprecedented sea incursion flooded their homes and then breached the road nearby. 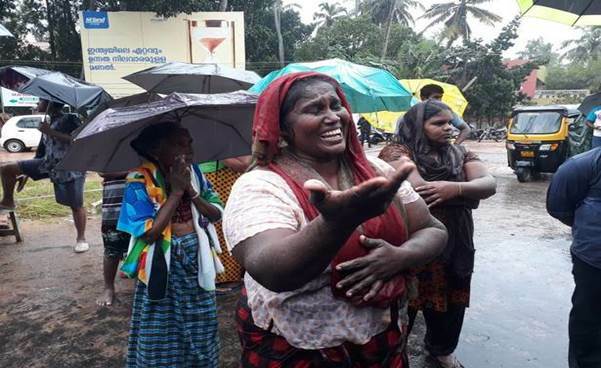 As many as 29 people died and 161 fishermen were still missing after Cyclone Ockhi in Trivandrum Acrhdioces. A total of 556 fishermen were also rescued by relief and rescue teams from seas. Distressed family members of missing fishermen blocked the National Highway in Poonthura and other places in Tiruvanthapuram District. Society of St Vincent De Paul, National Council President, Bro. Johnson Varghese, & Bro Sebastian Thomas visited the at relief Camp in Poonthura on 7th December, 2017 and held discussions with Fr Justin Judin, Parish Priest, St Thomas Church Poonthura, Fr. Y Dyson, Parish Priest Nanthencode, Fr Michal Thomas, BCC Secretary of Trivandrum Arch diocese (Latin rite) & Bro Zacharias President Trivandrum Council, Bro Don Bosco, Sr. Vice President, Trivandrum Central Council and other Vincentians were present on the occasion. Addressing a press conference here on 5th December, 2017, Vicar-General of Thiruvananthapuram Archdiocese (Latin rite) Fr. Eugene H. Pereira said a visit by the Prime Minister would instil confidence among the fishing community. His Grace Most Rev. Dr.Soosa Pakiam, M, Archbishop of Trivandrum Acrh Diocese. (Latin rite) Most Rev. Dr. Christudas Rajappan, Auxiliary Bishop, Fr. 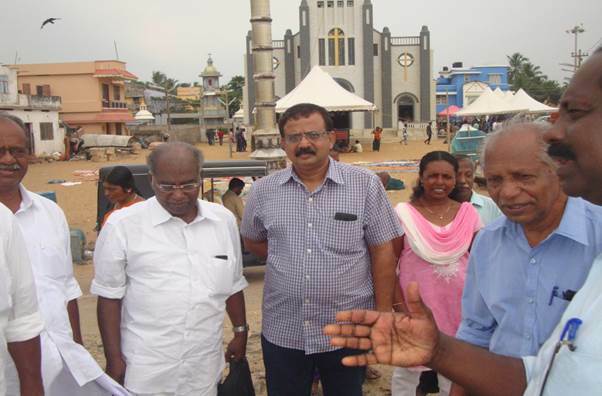 Eugene H. Pereira Vicar-General of Trivandrum Archdiocese visited the cyclone affected areas. Meanwhile Sacred Heart Conference Nanthencode visited the resucued fishermen in General Hospital and distributed financial assistance of Rs 14,000 on the 1st day and and on 2nd day we distributed 75 number of buckets and mugs for their toilet use.Besides we have vitited Poonthura area twice and planning to help some families in distress, and out members are visiting and effected areas almost every day. The Vincentians of Trivandrum Central Council which comes under Trivandrum Acrh Diocese. (Latin rite) are regularly visiting the affected families and consoling them and making efforts to consul the affected families.. Though the effects of Ochki cyclone is similar to that of Tsunami in 2004 so far nothing has been done for the suffering people. The effected people are in a state of shock and it will take a long time to bring them to normalcy of Trivandrum Central Council which comes under Trivandrum Acrh Diocese. 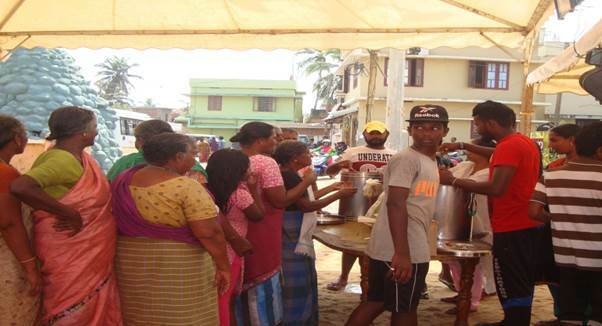 (Latin rite) are regularly visiting the affected families and consoling them. Though the effects of Ochki cyclone is similar to that of Tsunami in 2004 so far nothing has been done for the suffering people. The effected people are in a state of shock and it will take a long time to bring them to normalcy.